Construction has already begun on the first two phases of the boardwalk, but a delay is anticipated on the third phase, an official said. ROCKAWAY PARK — The rebuilding of the Rockaways' boardwalk will likely be delayed another three months as the design is modified to address community concerns about access to the waterfront, according to an official. The delay, the latest of many since the city began the project after Hurricane Sandy, will impact the more than mile-long stretch that will also include a giant "ROCKAWAY" sign implanted into the boardwalk. Phase 3 of the project, from Beach 108th Street to Beach 126th Street, is now "behind schedule" after residents asked for more access points and ramps to the beach, Emil Martone, senior vice president of the capital program from the Economic Development Corporation, said at a community meeting. "At this point I don't believe we're going to hit Memorial Day 2016," which was the original deadline, he said. The city anticipates a delay of "two or three months" as the new design, which was tweaked to include more access ramps, awaits approval, according to Martone. Martone also revealed that the city hadn't secured a contract for the boardwalk's concrete decking, which will be built off-site and replace the wooden decking. Each revision of the project has to go through the Public Design Commission, which vets the aesthetics of city projects. Construction has already begun on the first two phases of the project, and Phase 3 work should begin soon, the city said. Phase 1, which covers Beach 84th to Beach 97th streets, began in April and is still scheduled to be open by next Memorial Day. Phase 2, which covers Beach 97th Streets to 107th Street, began in June and is also still projected to be completed by July 4, 2015. Construction to cap off the pilings that are driven into the sand will begin the week of Oct. 13, Martone said, but the city will have to wait to install the concrete planks that will rest on them because they don't know who will build it yet. "There will be a lag between when the pile cap goes on and the deck goes on," he said. "We're still in the process of finalizing the bidding on that." An official said there isn't a signed contract yet "but this was accounted for in the schedule and is not a delay." The project to rebuild and repair the boardwalk since Hurricane Sandy damaged or destroyed much of it in 2012, has been plagued by delays, including time spent waiting for the nesting season of endangered birds. 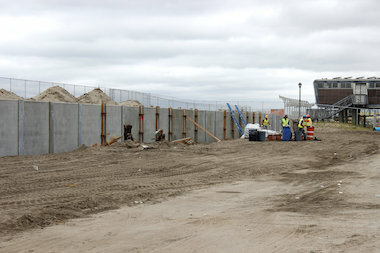 In August, officials said the giant "ROCKAWAY" that will be seen by travelers in planes landing into nearby John F. Kennedy Airport will say "OCKAWAY" for more than a year since the "R" is being built in phase three. Now the word is likely to be incomplete for even longer with the latest delay, according to the city. The full boardwalk should be completed by Memorial Day 2017, officials said.